It all started a couple of months ago when i decided that i wanted to renew my drivers’ license a year early so that i could get my final address on it and simultaneously have it upgraded to the new “Real ID” format required if you’re trying to fly someplace or enter a “secured” federal office. After forty-something years of dealing with the DMV, i’m wise to the system and know that if you make an appointment with them, you can just breeze right through whatever you’re there for instead of waiting literally for hours, much of it standing in lines. They assigned me an appointment a couple of weeks ago, instructing me that i needed to bring with me my social security card, proof of my identity, such as my current drivers’ license, and proof of my current residence, such as my PG&E bill. No problem, i thought. I couldn’t find my social security card, but luckily i had my redwhiteandblue Medicare card, which you can’t get without being enrolled in social security and which uses your SSN as your Medicare number. Of course i had my drivers’ license, and i printed out my latest PG&E bill, which i get electronically but which shows my current address, that being what they’re after. I did make a little mistake, though. I got to my appointment early, where i discovered this huge line leading to the appointments window. Omigod. So i joined the end of it and finally, as it inched forward, was able to hear this this guy in a DMV outfit calling out times, so it’s a total waste of time to get there early. Ahhh. When he calls your time, you and the others in your cohort get to go to the head of the line, and after a few minutes you get to talk to someone. Her job is to see whether your papers are In Ordnung. She glances at my drivers’ license and my PG&E bill, but when i hand her my Medicare card, she says, “This is not your social security card” and is utterly unmoved when i point out that i couldn’t have got it without having the social security number emblazoned on the front. “Go to Window 17”. I walk down the row of windows until i come to 17, where there is a short line that i get in. When it’s my turn i tell her that i was sent there because i had my Medicare card rather than my social security card, whereupon she cuts off further explanation and gives me a new appointment a couple of weeks later, to which she cautions me that a social security card must be brought. And then she takes pity on me and admits that all the employees there know very well that the medicare card has your social security number on it, but they are required to accept only the social security card. What a kind thing to do, and i thank her for it. She then hands me a multipart form, telling me that i can save myself some time on my next visit if i already have this form filled in. I thank her again and wish i had a jar of jam in my pack. I get back home and go online to see how i might get a social security card to replace the one that must have been lost sometime at some point after the original was issued in 1956. Yep, there’s a procedure, but then i realize that the odds are against my having a new card in hand by my next appointment, and i start ransacking for the original. And glory be, i find it. Ahhhh. Problem solved. So for my next appointment i arrive at the DMV almost precisely on time and clutching my documents. When i get to the intake window i show her my documents, and she hands me some forms to fill out. I show her that i have already filled them out. She tells me the forms have changed and i have to fill out the new ones and bring them back to her. Yep, in the past two weeks, the forms have changed even though they do seem to be demanding exactly the same information. But i fill them out and get back in the short line for her window. She checks the forms, determines that i’ve filled them out completely, writes a two-character four-digit number at the top of them, and tells me to sit over there and wait for my number to be called. As i sit there straining to keep my eyes focused on the screen displaying the numbers that come up in random order forcing you to look carefully at every one, it occurs to me that Sartre’s depiction of hell was wrong. Hell is watching that damn screen for all eternity, hoping that your number will come up. But it does after only a few minutes, and i walk to the assigned window and hand over my forms, my social security card, my drivers’ license, and my printout of my PG&E bill. Oops. There’s a problem. The printout clearly shows my address, which is what they’re after, but she points out that my name is somehow shortened to just “Matte”. I protest that i just printed out the bill as PG&E sent it to me, and she says she’ll have to consult her supervisor. When she returns, the news is of course that the supervisor has not accepted this bill, but she takes pity on me and suggests that there’s a cafe nearby where i can go online and find another page from PG&E that shows both my full name and my address. Furthermore, when i come back, i can just hang around while she finishes with whoever she’s working on and she’ll take me then so i won’t have to go back to the dread Window 17. Thinking rapidly, i realize that it would be just as fast if i simply rode back home and used my own computer to hunt for the right page from PG&E, which i do, only to keep coming up with pages that don’t show my full name. Then i realize that even though they suggest PG&E, all they’re after is a bill that shows my address, and i dig into my files and find a bill from my health insurance that was sent before i went electronic. Ta da. So i race back to the DMV, noticing enroute that my battery level is dropping alarmingly and that it might not be adequate for two round trips to the DMV. Fret fret, but we’ll worry about that later. I go racing into the building and go to the window where the last woman was working, but nobody’s sitting there. Hmmm. There’s a woman at the next window who’s not helping anyone at the moment, and i tell her that the nice lady at the window beside her had told me to come back to her window. Is she on a break? Alas, she’s gone for the day. Back to Window 17, where i’m given a new number to watch for while i worry about the whole operation shutting down before my number comes up. But it does, and i go to a window where there’s, for a change, a guy. He listens to a short version of my tale of woe while he examines all my papers and declares them just fine. What? No problem? Really? I’m delirious with joy as he processes me, takes my $20, and sends me to the last stop, the photography booth. No comb. And i have a serious case of helmet hair. Oh well, that’s what i look like most of the time. So i’m done. I have a temporary paper license to use until my new one arrives in the mail. The rest of the good news is that i made it home before the last battery bar flickerered out. Meanwhile, here’s a fine display of San Francisciana. 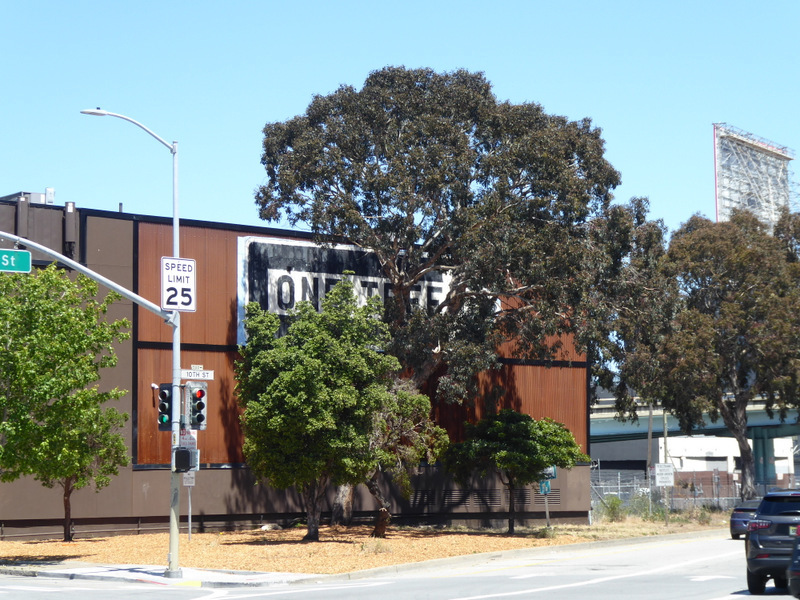 Twenty years ago an artist painted “One Tree” on that wall, and at that time there was only one small tree on the lot. As time has passed, people keep renewing the paint as the original tree grows and others are planted. Recently the owner of the building made the major changes seen in the photo below, moving the arrow to the right end of the building so that it no longer points at the tree and worse yet, is obscured by it. Oh well, it’s still an icon.